Enjoy stunning lake and island views and all the comforts of home at the Island View Home! This three story, three bedroom, three bath home is perfect for a vacation of relaxation and recreation. The bright kitchen on the main level opens to the dining and living room space. There is a bedroom with a Queen bed on the entry level and the upper level has two bedrooms (one Queen and one Double bed) plus an additional sleeping area with two twin beds. A spacious family room on the lower level leads to the patio. Each home is individual and decorated by the owners. The boat lifts are for owners use, but there is a place for you to moor your boat. Each home will have comforters, blankets, and pillows. All kitchens are equipped with dishes, glasses, small appliances, pots and pans, etc. Homes also are equipped with cable and/or satellite TV, DVD or VCR. Please bring any disposable items like trash bags, detergent, and paper products. We can provide linens for a fee. The large deck with seating overlooking the water is the perfect spot for relaxing in the sun. The extremely gentle to level lot makes the short walk from the house to the dock easy. The huge dock has room for all your water and boating activities. 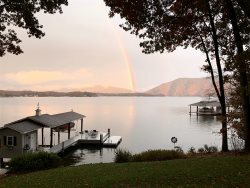 We loved our 5 days at SML and Island View fit the needs of 5 girls on a birthday trip perfectly! The house is spacious and well equipped. The best part was the convenience of having the dock so close with a short flat walk to get to it! We were in a quiet cove and it was wonderful! In addition, SML Vacation Rentals was great to work with. They were very quick to answer any questions that I had when booking. We also had a toilet issue during our stay, and they were there to resolve it in less than 30 minutes. Thank you! We are already talking about booking the same property for next year! You may check in any time after 3pm and check out is at 10am. We ask that you call our office at 540-721-2589 upon check out so we can start cleaning it right away. Our housekeepers need every minute between 10 and 3 to properly clean the homes and prepare them for the next guest. Linens are not provided with this home, but you may order them through our office. Linens include sheets for the required bed size, pillowcases, 2 bath towels, 1 hand towel and 1 wash cloth per person for the number of persons that the bed sleeps. A kitchen set is included which includes 2 rolls of paper towels, a small container of liquid soap and a scrubber. If you choose make up service, you will find all beds made upon your arrival.